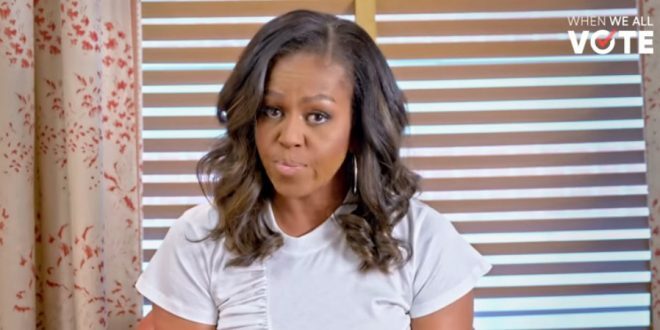 Michelle Obama Leads Get Out The Vote Drive [VIDEO] - Joe.My.God. Michelle Obama may not want to run for president, but she’s still dipping her toe into politics as the country approaches November’s midterm elections. Unlike her husband, though, who will be hitting the campaign trail in November, she’s not rallying voters specifically to Democrats. The initiative launched Thursday, July 19, with a public service announcement. According to people close to the campaign, there will also be live events in the coming months. It will feature “prominent activists and players” and peak in September with a number of events, rallies, and trainings. She’s joined by a lineup of famous faces, including actor Tom Hanks, singer Janelle Monáe, Houston Rockets basketball player Chris Paul, and Hamilton creator Lin-Manuel Miranda, who were featured in the YouTube video. responsibilities we all share in shaping our democracy. That means: VOTING!